On Twitter there are loads of really fun group chats about all sorts of topics. I take part in #CraftBlogClub every Tuesday at 8pm GMT. Every so often #CraftBlogClub set a fun challenge for us to take part in, this time it’s ‘Upcycling’ So, taking inspiration from the theme, I decided to use up my pile of scrap paper and old envelopes and make a handy Upcycled Envelope Notebook. Keep reading to find out how it’s made. Take your papers and envelopes and stack them up so that they all align on one side. It’s ok if some of the pieces are smaller than others, it makes the pages of the notebook more interesting! When you’re happy, keep them all together with a large clip. Use a guillotine or scissors to cut down the stack of papers into a neat square or rectangle. Now that all the papers are trimmed, you can rearrange them into pages. With the envelope pieces, you can leave them whole to act as a little pocket in your notebook. You can also cut them along the joins to turn them into separate pages. I think it’s fun to have the windows in the envelopes showing upwards so that you can see the writing on the page underneath. Stack up the pages into a neat pile. Take the coloured card you have chosen for the covers, and trim it to the same size as your paper pieces. Place one cover on the top of the stack and one cover underneath. Align everything neatly and clip it together. On the front cover, about 1cm away from the left edge, we’ll make some holes to sew the binding. Measure and mark three holes roughly equal distance apart along this left edge. My notebook measures 15cm high so I’ve marked holes at 3.5cm, 8cm and 11.5cm. If your notebook is thin enough, you may be able to poke through the hole marks with your large needle. If your notebook is too thick, you could use an awl, hammer and nail or even a drill. Now to sew the binding! Take a long piece of string and thread it through the needle, tying a large knot at the end. Starting at the bottom third hole, bring the needle up from underneath and through the hole. 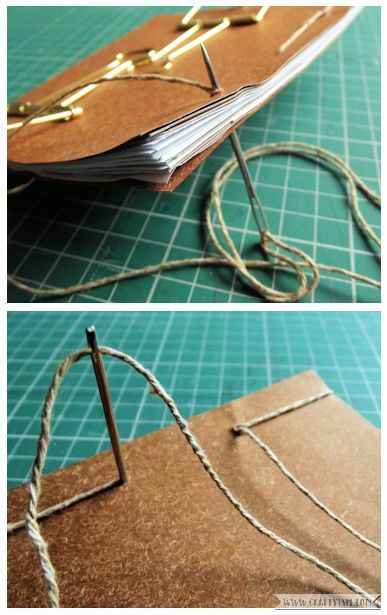 Take the needle and string over the bottom edge of the notebook, and back up through the same hole from underneath. Next pass the needle through the middle hole, going from the front to underneath the notebook. Bring the needle up through the top first hole, going from the underneath to front of the notebook. 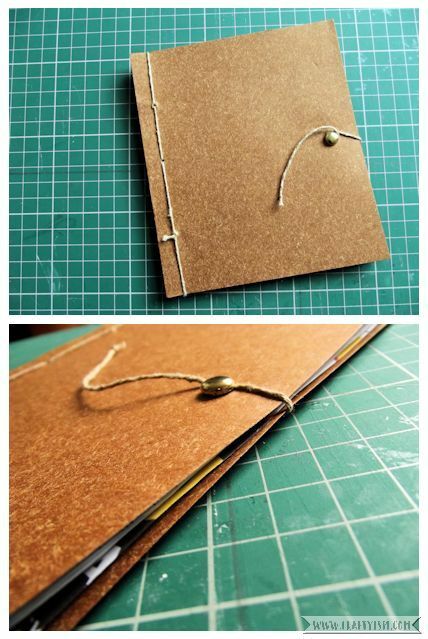 Take the needle and string over the top edge of the notebook, and back up through the same first hole from underneath. Go back down the middle hole, from the front to underneath. Lastly, bring the needle up through the bottom third hole, from the underneath to the front of the notebook. Tie a large knot in the string and cut off the excess. To make the fastening, measure and mark the halfway point on the right edge of the front cover. My cover measures 15cm, so my mark is at 7.5cm. Make the mark about 1.5cm in from the edge. Place a butterfly pin through the mark and open up the pin so that it lies flat of the reverse of the cover. Cut another long piece of string, this will be used to fasten the notebook. 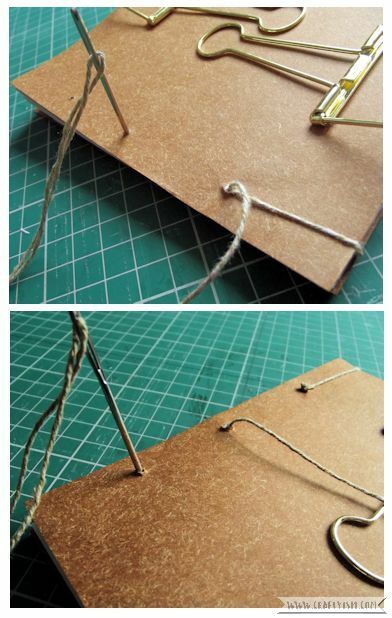 Tie the string around the middle hole of the binding on the back cover. 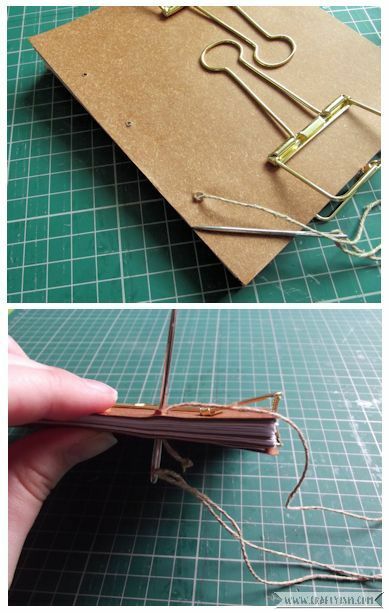 You can now bring the string to the front cover and wind it around the butterfly pin to fasten the notebook. 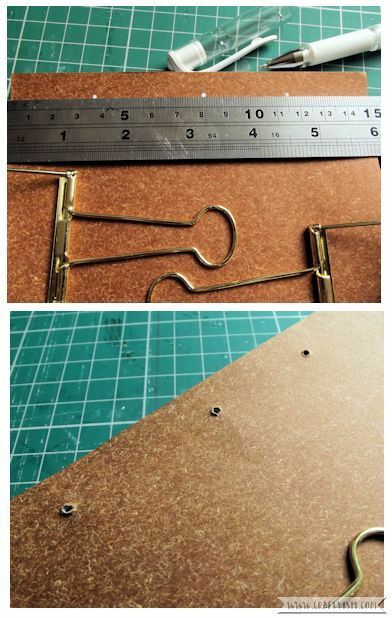 Now your Upcycled Envelope Notebook is finished! 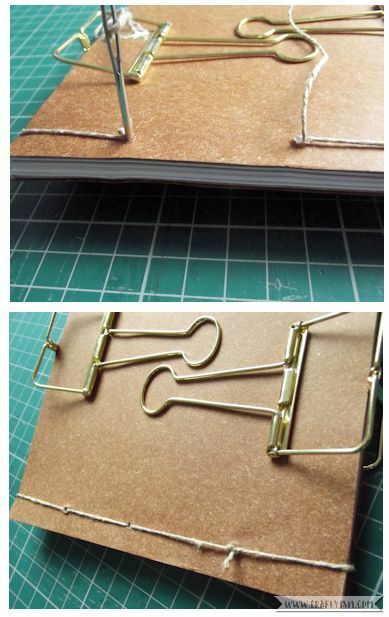 Depending on how many old envelopes and scraps of paper you have, your notebook could be quite thin, or really chunky! These notebooks are great to carry around to write quick reminders or phone messages on. The fact that there are little clear windows and patterns from inside the envelopes, makes it just a bit more interesting than plain pages! If you want to take part in the #CraftBlogClub upcycling challenge you definitely can! Visit the #CraftBlogClub website or join in with the Twitter chats every Tuesday by following @CraftBlogClub. It would be great to see what upcycled crafts you all come up with.